In this dazzling exploration of one of the most contradictory periods of literary and artistic achievement in modern history, journalist Andy McSmith evokes the lives of more than a dozen of the most brilliant artists and writers of the twentieth century. 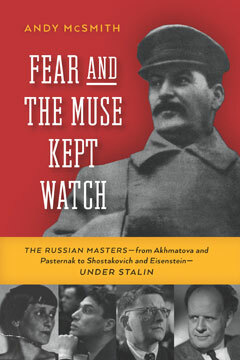 Taking us deep into Stalin’s Russia, Fear and the Muse Kept Watch asks the question: can great art be produced in a police state? For although Josif Stalin ran one of the most oppressive regimes in world history, under him Russia also produced an outpouring of artistic works of immense and lasting power—from the poems of Anna Akhmatova and Osip Mandelstam to the opera Peter and the Wolf, the film Alexander Nevsky, and the novels The Master and Margarita and Doctor Zhivago. For those artists visible enough for Stalin to take an interest in them, it was Stalin himself who decided whether they lived in luxury or were sent to the Lubyanka, the headquarters of the secret police, to be tortured and sometimes even executed. McSmith brings together the stories of these artists—including Isaac Babel, Boris Pasternak, Dmitri Shostakovich, and many others—revealing how they pursued their art under Stalin’s regime and often at great personal risk. It was a world in which the poet Vladimir Mayakovsky, whose bright yellow tunic was considered a threat to public order under the tsars, struggled to make the communist authorities see the value of avant garde art; Babel publicly thanked the regime for allowing him the privilege of not writing; and Shostakovich’s career veered wildly between public disgrace and wealth and acclaim. In the tradition of Eileen Simpson’s Poets in Their Youth and Phyllis Rose’s Parallel Lives, Fear and the Muse Kept Watch is an extraordinary work of historical recovery. It is also a bold exploration of the triumph of art during terrible times and a book that will stay with its readers for a long, long while. Tom Lavoie writes, "Using extensive primary and secondary sources, McSmith reveals a remarkable story about art triumphing over evil." "Lovers of Russian literature and music will find Fear and the Muse Kept Watch valuable, and history buffs will get a fearsome picture of life under Stalin." "McSmith pieces together many stories in a way that is thoroughly engaging from start to finish."